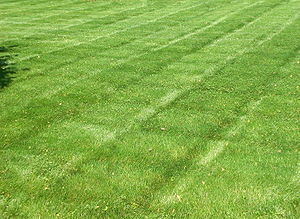 For the past two years, I have sliced and seeded the yard at our home. Last year we had a tree taken out which led to a large bare spot that needed to be covered. Last year I also had to deal with using Round Up on weeds instead of something that doesn’t kill the grass. This year we have had a hot summer and there were some bare spots that had developed in August and September. Again Jesus began to teach by the lake. The crowd that gathered around him was so large that he got into a boat and sat in it out on the lake, while all the people were along the shore at the water’s edge. He taught them many things by parables, and in his teaching said: “Listen! A farmer went out to sow his seed. As he was scattering the seed, some fell along the path, and the birds came and ate it up. Some fell on rocky places, where it did not have much soil. It sprang up quickly, because the soil was shallow. But when the sun came up, the plants were scorched, and they withered because they had no root.7 Other seed fell among thorns, which grew up and choked the plants, so that they did not bear grain (Mark 4:1-8, TNIV). Previous Post Clergy: Will You Learn to Manage Stress or Burnout?